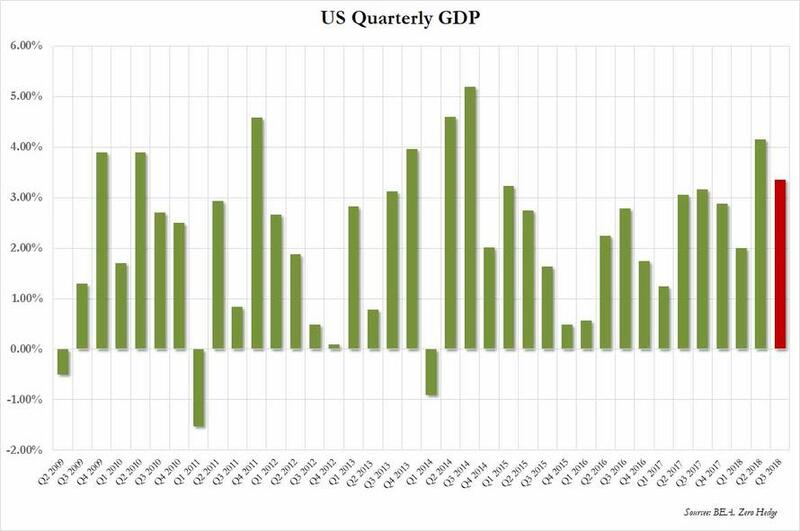 With the US economy firing on all four cylinders heading into the 3rd quarter, largely thanks to the latent effects from Trump's fiscal stimulus, the BEA released its final estimate of Q3 GDP which confirmed what we learned first two months ago, and was revised last month, namely that the US economy grew at an annualized rate in the mid-3% range, in line with both expectations and the first estimate released a month ago, although the final estimate showed a modest slowdown to the prior revision, with Q3 GDP now said to have grown 3.4%, below the 3.5% 2nd revision and consensus estimate. Combined with the 4.2% GDP growth in the second quarter,, the results capped the best back-to-back quarters since 2014. At the same time, growth is projected to moderate significantly this quarter, with estimates now running in the mid to low 2% range. Furthermore, just like last month, a quick look at the internals reveals some ugly details below the surface. While household spending remained strong, rising 3.5% after 3.8% in Q2, the largest increase since Q4 2014, it shrank from both the first estimate of 4.0%, and the second estimate of 3.6%, and missed expectations of 3.6%, contributing 2.37% of the bottom line 3.360% GDP print (below the 2.45% in the second estimate), the main reason why the US economy grew as fast as it did in the third quarter was a build up in inventories, which contributed even more than was previously estimate, or some 2.33%, or 69% of the bottom line number. 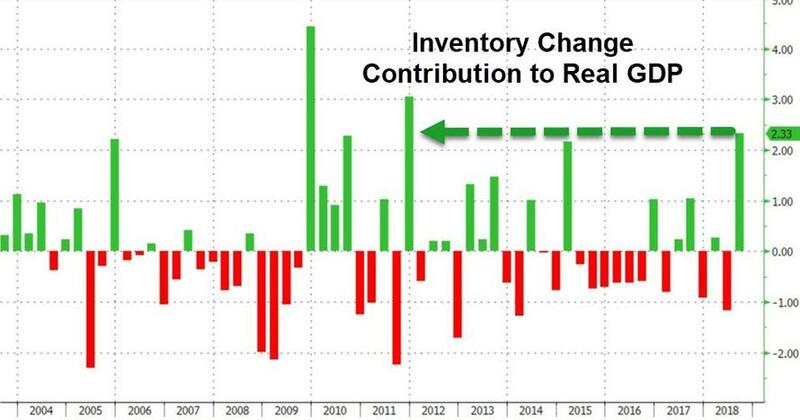 This was the biggest quarterly inventory stocking since the last quarter of 2011, and also implies that excluding Inventories, GDP rose a paltry 1.0% in the quarter. Another change from the second GDP estimate came from a slightly weaker business investment offsetting the increase in inventories, while most other categories were in line with earlier readings. Net exports subtracted 1.99% from growth, while inventories provided a 2.33 point boost. 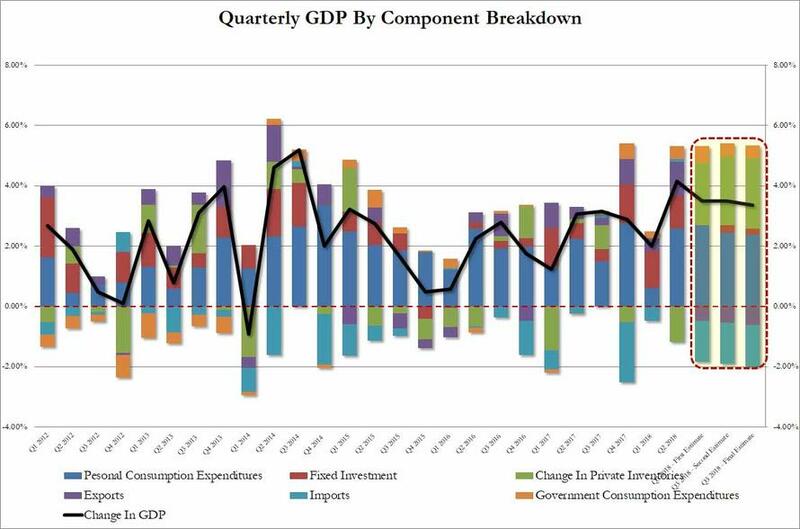 All other components of GDP were ugly, with nonresidential fixed investment, or spending on equipment, structures and intellectual property shrinking to 2.5% in 3Q after rising a blistering 8.7% in the prior quarter. Government spending added 0.44 point to growth, unchanged from the prior revision. In other words, between CapEx and Net Trade, the US economy actually contracted by 1.8%. Profits of domestic nonfinancial corporations increased 6.4% after increasing 4.2%. Profits of domestic financial corporations decreased 1.3% after increasing 3.7%. Profits from the rest of the world increased 0.3% after decreasing 0.9%. Other details from today's GDP report showed that the economy may have indeed peaked, with core PCE rising 1.6% in 3Q after rising 2.1% prior quarter, slightly beating expectations of a 1.5% print. The GDP price index also beat expectations, printing at 1.8% in 3Q after rising 3.0% prior quarter. Meanwhile, rising risks to the outlook include the escalating trade war with China, a slowing global demand (see today's Tiffany's results) and rising borrowing costs, while the boost from President Donald Trump’s fiscal stimulus is expected to end next year.